Milestone Xprotect Enterprise provides top-of-the-line features for an unlimited number of cameras, multiple servers and multiple sites. Milestone XProtect Enterprise is the most comprehensive version of Milestone IP video surveillance software: the perfect choice for larger installations. 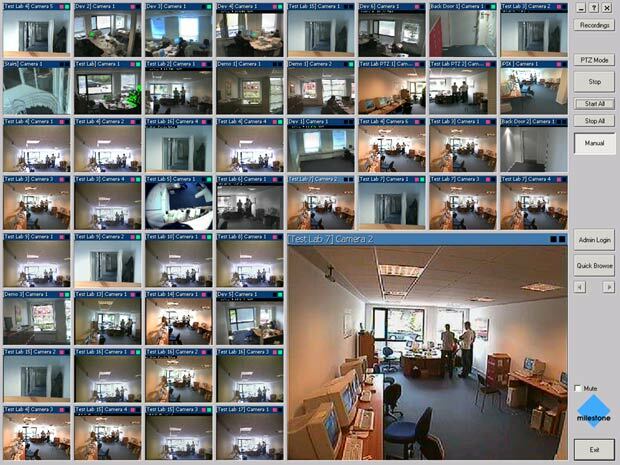 XPE handles an unlimited number of cameras, multiple servers and multiple sites. It is a top performance solution, well suited to the sophisticated high-end of the security market. XProtect Enterprise provides a state-of-the-art IP video surveillance system, supporting the widest choice of network cameras and video servers, with the equipment connected to an office LAN or other TCP/IP network, such as the Internet. Digital recording is saved directly onto the hard drive(s) of the PC. For an excellent solution to enterprising surveillance needs. � Advanced IPIX support with 'Quad Views' of all 360 degrees at the same time! [Find out more...] Milestone Xprotect Enterprise "Factsheet", 2,565kB pdf file. [Find out more...] Milestone Xprotect Enterprise "Administrator's Manual", 2,750kB pdf file. [Find out more...] Milestone Xprotect Enterprise "Administrator's Getting Started Guide", 457kB pdf file. [Find out more...] Milestone Xprotect Enterprise "Complete Manual", 5,084kB pdf file. [Find out more...] Milestone Xprotect Enterprise "Monitor & Viewer User's Manual", 590kB pdf file.